What will the Phantoms do with the youth influx of Morgan Frost, Joel Farabee, Isaac Ratcliffe and Matthew Strome? The Phantoms 2018-19 season isn’t quite over yet. They will close out it over three more games, including the finale this Saturday at home against Hartford. Their playoff hopes hang on a thread and with their magic number at 13 currently, it is doubtful that it comes to pass. With that, we can start talking about their future and what are the likely questions and the scenarios in which we can see being played out over this upcoming offseason. Do they roll with the kids or bring back the ‘veteran presence’? Bailey and Aube-Kubel are fairly safe bets to be tendered contracts this offseason, but after that it gets a bit dicey. Varone and Knight have seen some significant time with the Flyers this season, but neither has exactly impressed the front office I would think. Both have shown to be above-average AHLers in their career, but may look for opportunities elsewhere in a less crowded organization. Ditto with Greg Carey. McDonald and Conner are captain and alternate captain of the Phantoms, respectively. Despite this, it’s tough to say what this new GM will have to say in building this Phantoms roster. I know we as fans would prefer a youth movement, but odds are that some of these veterans will be back in the fold. Group 6 free agents (must be elected by the player): Players who have reached age 25, who have 3 accrued years of professional experience (that is, beyond junior or collegiate hockey), and whose contracts have expired, but have played less than: 80 NHL games played for forwards and defensemen. 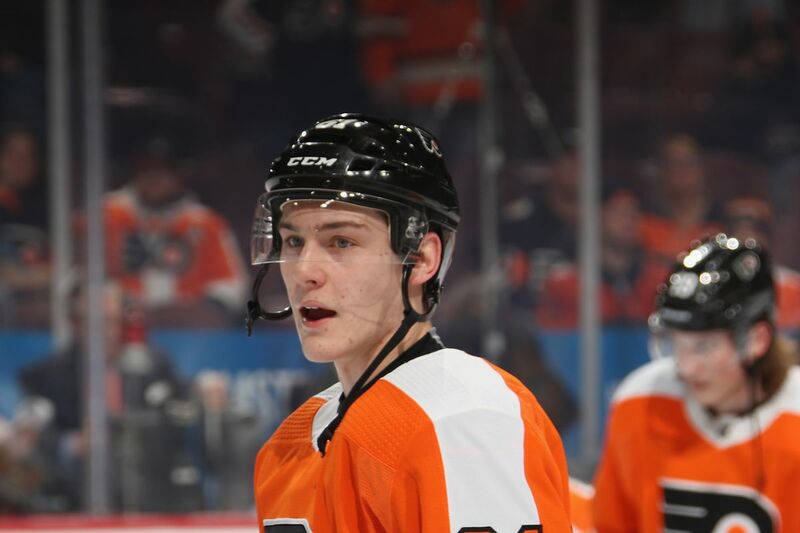 What if Joel Farabee doesn’t make the Flyers season-opening roster? Do Wade Allison and Tanner Laczynski forgo their senior collegiate seasons and sign entry-level contracts? Have the Phantoms finally found a functional goaltending tandem? What is this defense and how does it get better? Who is the coach that is going to have to make these difficult lineup decisions? Scott Gordon led the Phantoms, until his promotion, to a 14-9-4 record. Kerry Huffman inherited the head coaching title and has accumulated a 22-21-3 record. Does either really inspire confidence going forward? You could argue that Huffman didn’t have the same tools as Gordon given the constant injuries (Rubstov/Kase) and promotions (Varone/Knight/Bailey) as his predecessor. Scott Gordon, to much chagrin of this fanbase, could have the “interim” tag lifted off his current position and remain in the NHL. In any case, I do hope the Flyers put someone in charge that will be able to properly coach and develop all of these young players. What could be the opening night lines look like for the Phantoms? Revisiting our pre-season over/under predictions Looking back on a much more optimistic time.